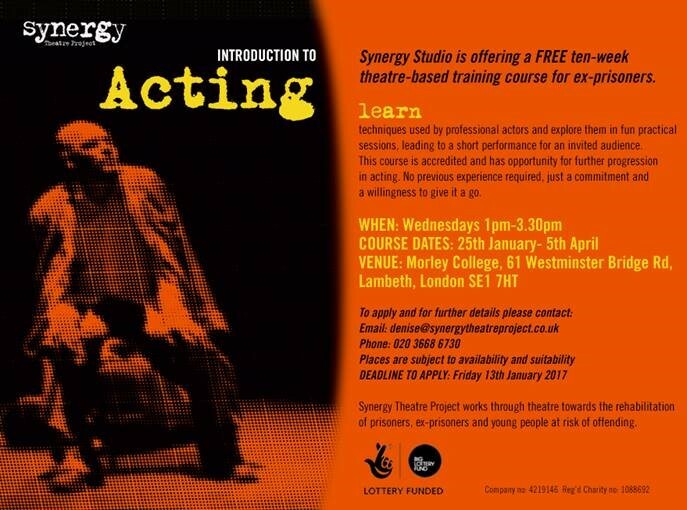 Synergy Studio is offering a free ten-week introduction to acting course for ex-prisoners starting in January. Participants will learn techniques used by professional actors and explore them in fun, practical sessions, leading to a short performance for an invited audience. This course is accredited and provides opportunities for further progression in acting. No previous experience is required, just a commitment and a willingness to join in. The course will run every Wednesday from 1 – 3.30pm. For more information, please contact denise@synergytheatreproject.co.uk or call 0203 668 6730. The deadline for applications is 13th January 2017.